Here is our "Cast of Characters"
that bring the workshop to life. Marialaina is a member of the LRTC Board and heads up the LRTC Learning Center in Knightsen, CA where she and the "KBR Crew" take on some of the most difficult mustangs. She and the KBR Crew have been particularly innovative with respect to bombproofing and developing horses that are comfortable around humans and human activities. Marialaina competes in competetive trail trials with her mustangs. Cher is the event's Safety Officer and burro specialist. (Sometimes she's secretly referred to as "the Burro Babe.") 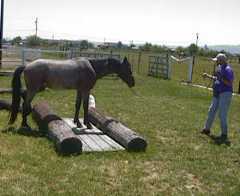 She can actually do some high quality horse training also. Teaching behaviors using "clicker training" is one of her specialties, including such useful items as lifting feet and laying down on cue. Sharon focuses on "adaptive approaches" involving horses that are anxious, mishandled or otherwise distracted and have a difficult time in conventional training situations. 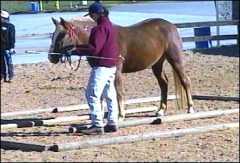 She uses a combination of traditional natural horsemanship approaches, clicker training, Tellington-Jones approaches and related useful ideas to help get horses focused, calm and under control. Willis considers himself a student of horse behavior and enjoys working with difficult horses, especially those whom others have given up on. His greatest enjoyment is the development of the "Dances with Horses" concept using music to help guide cadence and carriage. His mainstay with wild horses is his "Quiet Hour" approach. Rob has been involved with a host of wild horse and burro projects all over the country, including the gentling and training of the wild horses and burros that appeared in the Salt Lake 2002 Olympic Winter Games. 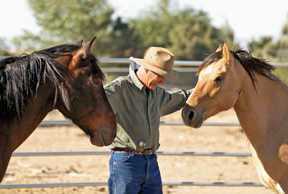 He is an Eagala Level I Equine Specialist. 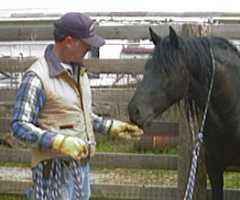 Rob also is the co-founder of WindHorse, a non-profit equine assisted growth and learning program. Windhorse has used wild horses and rescued thoroughbreds in its work. In adition to being a clinician, Betty Retzer is a member of the LRTC Board and operates the "Camelot" Learning Center in Stagecoach, NV. Betty also is owned by "Lucky," the so-called untrainable mustang along with a rather interesting crew of mustang companions. Jim was with us in Golden, CO, in 2000. 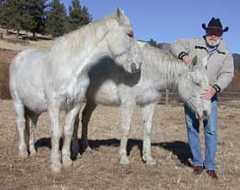 He's a "natural horsemanship" practitioner in Colorado and has worked with a number of mustangs. We're glad to have him back on the crew to round out our clinical team. Hue has studied TTEAM and related approaches and brings them together in her own style of developing body awareness, coordination and surefootedness in young, inexperienced and injured horses. 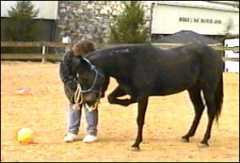 Her emphasis is in getting the horse to focus and sense how he should use himself. Tony is from Kenya where he was exposed to approaches that are similar in concept but different in technique from what we are accustomed to in the US. His gentling and training style involves a great deal of touching and desensitizing, is quite effective and can be easily integrated in with our customary approaches. Continue to View the Rest of the Crew!